Celebrate Halloween With Us at PumpkinFest! Dayton, Tennessee – October 18, 2016 – The annual PumpkinFest is now a tradition in downtown Dayton, Tennessee. The festival offers an alternative to traditional Halloween activities, with two days of fall festival fun, food, games, entertainment, & Halloween festivities for the whole family! PumpkinFest kicks off on Friday, October 28th, with food and craft vendors, shopping downtown, Punkin Chunkin, Scary-Oke, and a movie in the park in the evening. Saturday, October 29th will have more shopping, a car show, hay rides, a pie eating contest, a costume contest, a chili cook-off, trick-or-treating, and lots of family-fun entertainment! Make plans to come now! 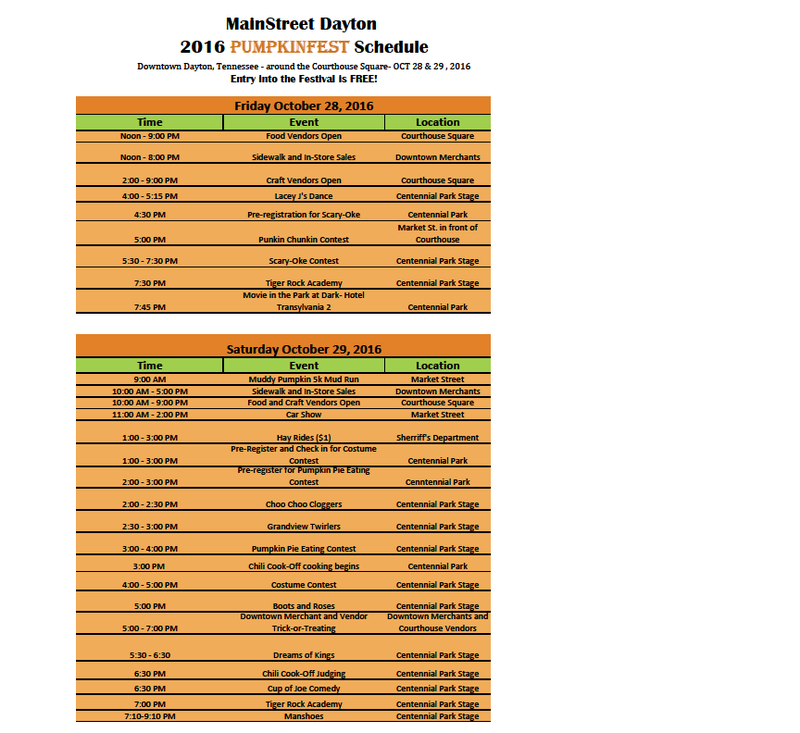 Below are more details regarding particular events; a full schedule can be found at http://www.mainstreetdayton.org/Events.html. Punkin Chunkin, 5:00pm: Kids up to age 18 can chunk a pumpkin down Market Street – whoever throws the farthest wins! Scary-Oke Contest, 5:30 to 7:30 PM in Centennial Park: Pre-registration begins at 4:30PM next to Centennial Park All ages welcome! Categories: 12 and under, Teens (13-18), Adults (19+) Maximum 20 contestants, so get there early to get a spot! Movie in the Park, 7:45pm in Centennial Park: There will be a showing of Hotel Transylvania 2 – bring your family and friends! 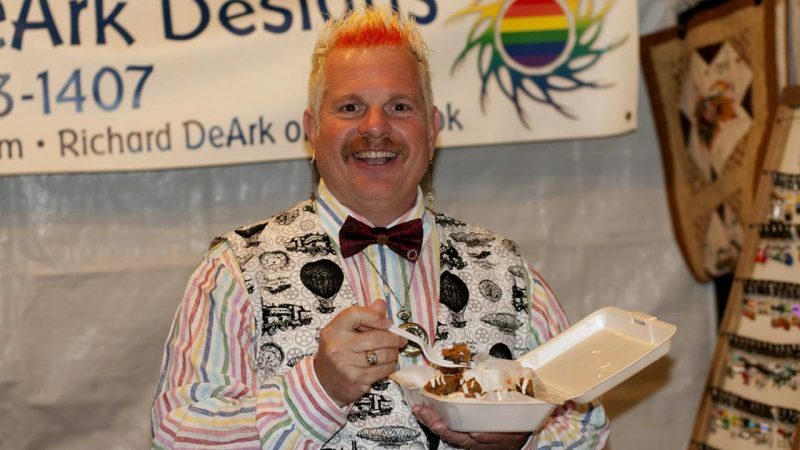 Pumpkin Pie Eating Contest, 3:00pm, Centennial Park Stage: Eat the most pie and win a prize! Trick or Treat, 5:00pm – 7:00pm: Visit all the downtown merchants to trick-or-treat! This local rock ‘n roll band will be bringing their entertaining “goodtime oldies show” to the Cenntennial Park Stage in Dayton on Saturday, October 29 as the headline act for PumpkinFest 2016. The banter-filled concert is from 7:10-9:10 pm. PumpkinFest goers are encouraged to bring a chair, blanket, or cushion to sit on to enjoy the show. Manshoes features music from the 60s, 70s, and 80s and will perform popular tunes from the likes of The Eagles, The Byrds, America, Van Morrison, and many others.